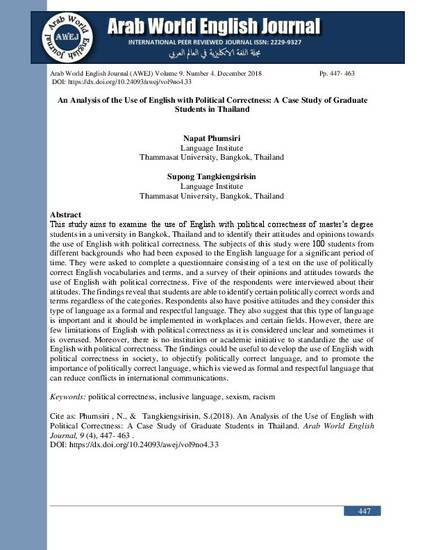 This study aims to examine the use of English with political correctness of master’s degree students in a university in Bangkok, Thailand and to identify their attitudes and opinions towards the use of English with political correctness. The subjects of this study were 100 students from different backgrounds who had been exposed to the English language for a significant period of time. They were asked to complete a questionnaire consisting of a test on the use of politically correct English vocabularies and terms, and a survey of their opinions and attitudes towards the use of English with political correctness. Five of the respondents were interviewed about their attitudes. The findings reveal that students are able to identify certain politically correct words and terms regardless of the categories. Respondents also have positive attitudes and they consider this type of language as a formal and respectful language. They also suggest that this type of language is important and it should be implemented in workplaces and certain fields. However, there are few limitations of English with political correctness as it is considered unclear and sometimes it is overused. Moreover, there is no institution or academic initiative to standardize the use of English with political correctness.  The findings could be useful to develop the use of English with political correctness in society, to objectify politically correct language, and to promote the importance of politically correct language, which is viewed as formal and respectful language that can reduce conflicts in international communications.